This 4K security camera is a cost effective alternative to our Ultra HD 4K Security Camera Dome with Video Analytics. If you don't need video analytics beyond video based motion detection, and simply need a great quality 4K picture then this camera is perfect for you while saving you plenty. 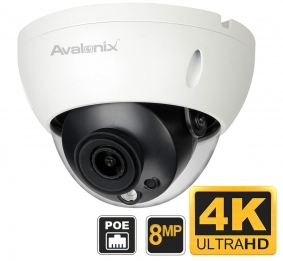 This 8 Megapixel (8MP) IP camera produces 4K Ultra HD resolution video that surpasses any HD quality camera on the market in terms of clarity and resolution. You can record video from this camera to one of our 4K NVR or to a PC based NVR software. 4K Security cameras offer unparalleled video resolution that allows for video recordings that can be zoomed in to while maintaining clarity. You can use digital zoom on the camera or the NVR to magnify video of interest during live view or playback as shown in our video here. This camera has a 8MP CMOS image sensor that allows the camera to record at 4K resolution (3840 x 2160 pixels). It comes standard with a 4mm lens that provides a 87 degree angle of view. Being 4K resolution, the actual image size is huge, meaning you can digitally zoom in up to 60ft away in daytime to recognize a face on video playback. The camera also has up to 100ft of night vision provided with by its infrared LEDS, and offers advanced image exposure compensation features such as BLC/ HLC/ True WDR. All these professional features are packed in to a compact dome camera case that is vandal/impact resistant and weather proof IP67. You can use the camera indoor or outdoors and rest assured it is tamper resistant if mounted correctly. This 4K IP Dome Camera can be mounted on a wall or ceiling. If you want the absolute best resolution available for security cameras, we suggest you get one of these. Powering the camera is easy. You can intergrate it with any of our PoE NVRs that offer plug and play compatibility with our cameras to simplify setup of an NVR camera system. You can watch how easy it is to setup our security camera systems here. You can also power the camera using a PoE switch or a 12V DC 1amp power adaptor. Since this is an IP camera, it can be streamed directly to your computer using our PC/Mac viewing client or Chrome, or to a NVR, mobile phone, or tablet device. We include our free Windows/Mac software suite to view video, or you can use any third-party video recording suite that accepts ONVIF compatible IP cameras. For best compatibility and ease of use we recommend using one of our 4K NVRs which also support H.265 for bandwidth savings. H.265 encoding offers a more efficient way to compress video than H.264. It offers nearly double the data compression ratio delivering the same video quality saving bandwidth and storage space. It is also compatible with PC based video recording suites that support IP cameras such as Luxriot, Milestone, and NUUO. 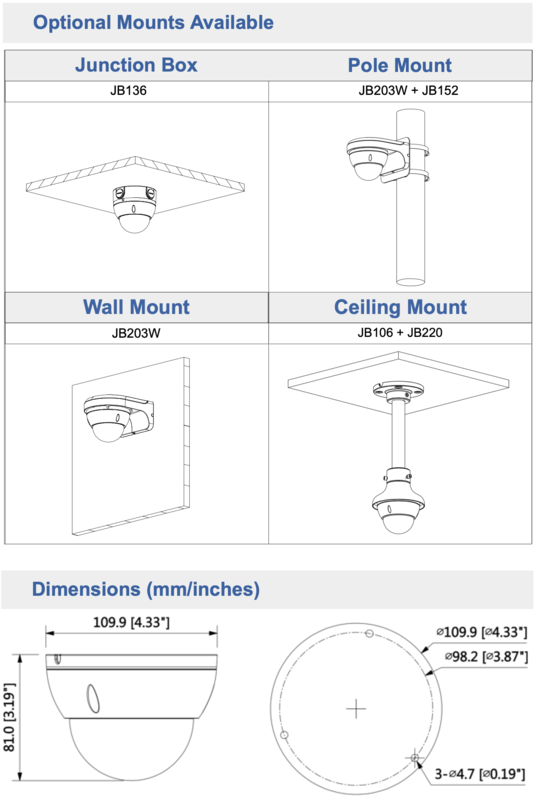 Can your 4k dome cameras be mounted to a ceiling/wall without a junction box? I'm looking at item IPC4K18D and want to just fasten it to a soffit /ceiling directly. Do you have mounting instructions you could send to me so I can make sure it would work? You can mount them directly to a drop ceiling as shown in this video. For wall mounting, or for mounting to a soffit, you do need the optional junction box.